One of my favorite spring combos are maxi dresses paired with moto jackets. It’s the perfect way to wear new spring pieces, yet still rely on our old fall favorites. Dressing for spring can be a challenge because of the cooler mornings/warmer afternoons, so this is the perfect way to dress for the season. The clutch is so cute with that pin flower! I love the dress! Wonderful! Beautiful photos! You look stunning and I love your dress, it’s gorgeous! So stunning babe! This floral dress is so awesome! OH love, you hit it outta the park again!!! The color combo is sensational and you literally look like a goddess!!! Brilliant to add a flower pin to the darling blush bag, the perfect accessory to top off the most beautiful spring dress! LOVE this to pieces!! Happy Monday gorgeous!! I love that you accessorized and accessory! That clutch is adorable and your maxi is pretty much the best thing ever for Spring! The color of this jacket is seriously to die for! LOVE it paired over the floral dress! Stunning! In love with your lavender moto jacket, perfectly styled with your gorgeous floral maxi! Love that maxi and such a fun handbag! I’m seriously impressed with your DIY skills, Shauna! I really thought it was part of the clutch!! This floral maxi dress is just gorgeous and I love how you paired it with that fabulous BLANKNYC moto. So springy! Happy Monday! Gorgeous! LOVE the jacket in that shade! Love this floral maxi dress and how cute it your jacket. You look gorgeous. Oh HEY beautiful! I am obsessed with the color of your moto jacket! You are giving me so many styling ideas! Thanks so much for linking up with me and Trendy&Tidy! The big print and big flower on the clutch are so beautiful and bold! That dress is gorgeous! I could see that being worn to so many different occasions this Spring and Summer! This jacket is sooo gorgeous! The color is so right for spring! This is such a beautiful jacket. I also like the flower clutch and flower maxi. It’s a gorgeous look! So so so pretty, Shauna!!!! What else would I expect from you though!? I love the color of your jacket and your little DIY with the flower pin on your clutch…looks like it was made for it :). Thanks for sharing with us at On Mondays We Link-Up xo! Wow that’s a pin? You are so darn fabulous !!! Floral perfection! You totally rock this dress and I pair my denim jacket with everything! Love this clutch! loving that jacket! super cute! This maxi dress and the moto jacket make the perfect combination, and I’m loving your DIY clutch! You look beautiful! Such a pretty look and I love your purple suede jacket! You look so lovely and feminine! I’m seriously dying over that gigantic flower pin!! I love the color of that jacket. So pretty, babe- and you know I’m loving that Blank NYC jacket! Wow, such a pretty outfit! The jacket is a wonderful color. 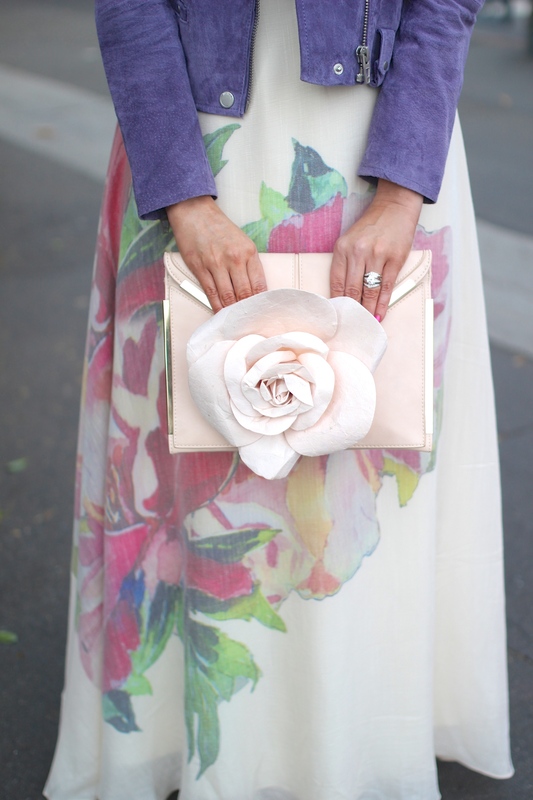 Such a pretty feminine floral dress and that clutch is just so adorable. You look so pretty Shauna ! The clutch is so cute with that pin flower ! love it ! I don’t think you can get any more fabulous! That pin and clutch combination is amazing and I love the dress! OMG this is such a gorgeous combo! I love that beautiful jacket and that dress is just WOW! I love all these spring colors! Such a beautiful outfit Shauna, I love everything you are wearing 🙂 Thanks for linking up to Creative Mondays. I will definitely copy the rose pin onto a clutch DIY. Thank you lol. Pretty look.What a lovely bag you have there. I love that jacket! Such a pretty color. That is a brilliant DIY moment and you look as lovely as ever! Omgggg girl! This outfit. I love it all – such Spring perfection. That dress is so beautiful and I neeeed that jacket. Need! What a unique idea to spruce up this clutch! Also, loving that purple jacket gf! Hoe pretty and springy! Love the whole look, especially the fun clutch!